Will Nokia's much-hyped new music phone live up to expectations? The persistence of manufacturers when it comes to touchscreen mobile phones has to be applauded. It might be that only a few - notably HTC, Apple and Palm - have really cracked the marriage of hardware and software - but that hasn't stopped everyone else attempting to achieve the same success. 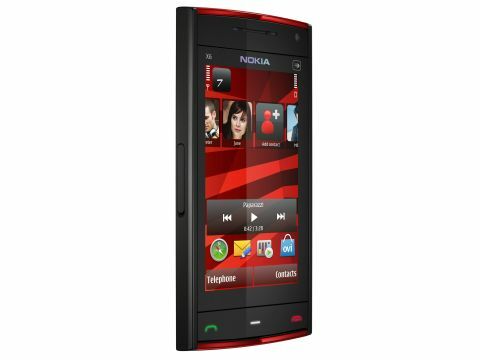 Nokia's own efforts have been hit and miss. The Nokia 5530 XpressMusic isn't without its good points, but all of Nokia's touchscreen phones so far have had resistive screens. Among other things, that means they all came with old-fashioned styluses, and didn't work properly when you touched the screen with more than one finger. That meant reduced typing speeds, and user gestures that are so intuitive on other phones – pinching to zoom on the iPhone, for instance - were unavailable. Nokia has heard its customers' complaints. The X6 looks like a traditional slider phone - at 13.8mm thick it certainly looks like it could accommodate a physical keyboard. However, there are hardly any buttons to be found as the 3.2-inch touchscreen is capacitive, theoretically making a physical keyboard redundant. There is a wealth of features besides. A whopping 32GB/16GB of internal storage and an FM radio make it tempting for entertainment even before you consider Nokia's intriguing Comes With Music service. Even the camera has received the kind of attention you don't see on cheaper models - a 5MP sensor behind Carl Zeiss optics gives the X6 plenty of sheen. But is the touchscreen a gimmick? The S60 operating system has a number of detractors, and just because a phone ticks all the right boxes on a specification sheet doesn't necessarily mean it'll make its users happy.